In the 1930s various trade unions from different backgrounds ranging from conservative craft unions, white racist industrial unions, white dominated racially mixed industrial unions and non-racial industrial unions merged to form one trade union called South African Trades and Labour Council (SATLC), popularly known as the Trade and Labour Council. In 1944 SATLC adopted the Workers Charter. This Charter was viewed as a vehicle to advance the struggle for the socialist government, which will emancipate the working people from exploitation and oppression. The split was caused by different political and ideological affiliations. Conservative members of the union were against the amendment of its discriminatory constitution, the formation of the local committees to facilitate non-racial working class solidarity, and the experiences of the Second World War and the militancy during the period alienated unions that were not interested in pursuing the aims of liberation politics. The passing of the Suppression of Communism Act by the government in 1950 enabled the state to increase its repressive measures against non-racial trade unions. In October 1954, right wing trade unions walked out of the SATLC conference held in Durban to form the exclusive White, Coloured, and Indian workers’ Trade Union Council of South Africa (TUCSA). Black workers were denied membership. Nineteen trade unions objected to the formation of the TUCSA. The remaining non-racial trade unions decided to set up a Trade Union Co-ordinating Committee, which had a meeting with the Council of Non-European Trade Union (CNETU). Trade Union Co-ordinating Committee led to the formation of the South African Congress of Trade Unions (SACTU) in March 1955. Apart from racial intolerance by White trade unions, the government also passed repressive legislations that made it imperative for Black workers to organise workers across the colour line. African trade unions were free to operate but where not legally recognised by the state. The Industrial Relations Commission, appointed by the National Party government called for the regulation and tighter control of Black trade unions by introducing registration and certification. The IRC also denied Black trade unions the right to join political organisations. In 1953 the government announced the Native Labour (Settlement of Disputes) Act in an attempt to control trade unions. This ACT was followed by the Industrial Conciliation Act of 1956, which was strongly challenged by SACTU. "The reason we are faced with an IC Act of this nature is because workers had accepted previous IC Acts, which gained them temporary advantages. We need not find ways and means of working within the Act. We could not leave the onus to a few unions. SACTU as a progressive organisation had to reject the Act”¦Why could we not negotiate from strength? Must we beg that a piece of paper will negotiate for us, that white workers should negotiate for us? Have we no confidence in our own workers that they will change the tide in South Africa? We must not underestimate their strength." Mpetha’s view to defy registration was challenged by other members of SACTU. They felt that the union is still young and not strongly united. Therefore the decision to defy the registration along racial lines was deferred until a united stand was found. 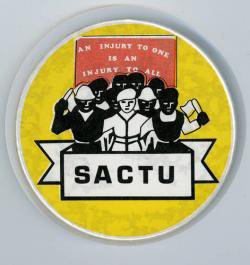 The inaugural conference for SACTU was held on 5 March 1955 in Johannesburg. SACTU emerged out of nineteen trade unions representing about 20 000 workers. The most important trade unions in SACTU were, the Food and Canning Worker’s Union, The Textile Worker’s Industrial Union and the National Union of Laundry, Cleaning and Dyeing Workers. From the beginning, SACTU committed itself to play a dual role of economic and political struggles. The conference adopted a Declaration of Principles and constitution. It also elected SACTU executive committee. The president, Petrus Beyleveld was drawn from the textile Workers Industrial Union and Leslie Ma ssina, formerly secretary of CNETU, became General Secretary. Cleopas Sibande and Lucy Mvubelo were elected to the two vice-presidents positions. Other members of the executive committee included Leon Levy, John Nkadimeng, Mark Shope and Billy Nair. SACTU put much of its focus on organising the unorganised workers. SACTU believed that to achieve a genuine transformation it would need to come into conflict with the state. The inclusion of the word Congress in SACTU’s title was a deliberate identification with the nationalist movement. Few months after its formation SACTU sent delegates to attend the Congress of the People, which adopted the historic Freedom Charter on 26 June 1955 and consequently became an active member of the Congress Alliance. It had representation on Congress Alliance’s National Co-ordinating Committee. After its formation South African Congress of Trade Unions (SACTU) attempted to strengthen and expand its support base since its effectiveness would depend on the strength of its local branches. The expansion was also influenced by the financial demands. For SACTU to pay organisers salaries and other running expenses it must get other trade unions to affiliate to it and boast their budget. Therefore it was imperative for SACTU to set up organising committees to mobilise other trade unions into its folds. The Laundry Workers and the Food and Canners became the main contributors to the SACTU coffers. The first organising local committees to mobilise other trade unions were set up in Johannesburg industrial centres. However their efforts did not produce desired impact on forming new and stable unions and recruiting new members. SACTU affiliation on the Witwatersrand remained stagnant at 15 000 between 1956 and 1961. The Rand committee was affected by the treason trial arrests. The ATWIU branch at the Amato textile mill in Benoni was weakened by the dismissals of its members as a result of the 1958 Amato Textile Mills strike. In spite of these frustrating challenges SACTU managed to establish and resuscitate 17 unions on the Rand and in Pretoria. This was achieved as a result of the campaigns and strikes involving wages initiated by SACTU. The situation in Eastern and Western Cape was much better. In 1956 six new trade unions were set up in Port Elizabeth in the sweet, milling, stevedoring, biscuit, cement and leather industries. In Cape Town the local committee drew resources and support from the Food and Canning Workers Union and the Congress to establish new unions. The membership of these unions was drawn mainly from the migrant African working classes. In Durban two textile workers, Billy Nair and Stephen Dhlamini led the mobilisation process. Although these two leaders were the Treason Trialists, Durban and Natal became SACTU’s organisational success areas. In 1959, 13, 500 Natal workers joined SACTU after an inspiration and courage they have accumulated from the popular militancy arose from the Cato Manor riots of June 1959 and enthusiasm for trade unionism of Chief Luthuli. New local committees were also formed in Pinetown, Ladysmith and Pietermaritzburg in the same year. After mobilising workers in the light manufacturing, food processing and services industries SACTU turned its focus to other industries such as agriculture, mining, transport and metal. However the situation in agricultural sector made it impossible for SACTU to mobilise workers. Workers in this industry were scattered and isolated. The other worrying factor was the constraints budget SACTU was operating on. And this made it infeasible for SACTU to reach out to these workers. As a result SACTU prioritise transport and metal industries as its focal point to mobilise support. SACTU was motivated by the fact that there were existing foundations to build upon in these two industries. The railway and harbour worker’s union existed in Durban, Port Elizabeth, Cape Town and Johannesburg. From 1956 SACTU registered positive developments in metal industry. In Cape Town, Port Elizabeth, and the East Rand new unions were established for metal workers. SACTU thus saw a rise in membership from 20, 000 with 19 to 53, 000 with 51 unions between 1956 and 1961. After realising that the struggle against the economic exploitation and oppression cannot be achieved in isolation SACTU turned to international arena to forge links with other international trade unions. Between 1955 and 1963, SACTU headquarters in Johannesburg opened communications lines with other international trade union federations such as the International Confederation of Free Trade Unions (ICFTU) and the World Federation of Trade Unions (WFTU). These links were extended to other countries such as Africa, North America, Europe, Latin America, Asia, Aust6ralia and New Zealand. The banned Assistant General Secretary, Phyllis Altman between 1956 and 1963, discharged the networking responsibilities.